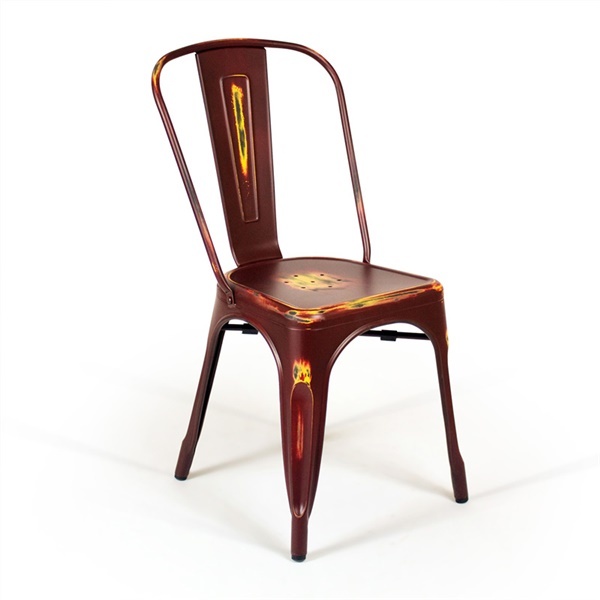 The Bastille Caf� Stacking Chair (Antique Red) by Inmod infuses bold personality into any dining space. A rich red finish adds the perfect amount of color and style. A galvanized steel frame offers unsurpassable strength while the zinc coating adds protection against rust. The Bastille Cafe Stacking Chair is the quintessential industrial bistro chair, and is an inspired reproduction of the classic Marais A (Tolix) Chair, by Xavier Pauchard. What originated in the Parisian cafes, restaurants and establishments in 1934 has become one of the most recognized and widely used seating solutions in the world because of its versatile function and stylish appeal. Revolutionary for it's time, the Marais was constructed using a process comprised of 100 manual tasks. Over 80 years later, our Bastille Cafe Stacking Chair has replicated these techniques and is built to the same specifiations as the original. Suitable for indoor & outdoor use in virtually any environment, the Bastille offers strength, style and sophistication. Its antique red finish adds warmth and character to a classic industrial icon. I wanted chairs with an artistic edge - these are exceptional! Just what the doctor ordered for sprucing up my pad! FINISH IS AWESOME! ATTRACTIVE & STYLISH - KITCHEN TRANSFORMATION COMPLETE! Awesome OUTDOOR patio chairs!! So happy they came right in time for summer!! I bought a set of these chairs for my new screened in deck because I figured they would be easy to clean. I love the design. They are sturdy and surprisingly comfortable. Nothing like having an awesome classic reproduction with a modern twist to it - tons of flattery already which is fine with me! I think this design is making a huge a comeback as several of my house guests have made remarks on the design and designer (which i had no clue about at the time of buying) and were equally impressed by the bold finish and quality of the reproductions - i'm joyfully surprised! !